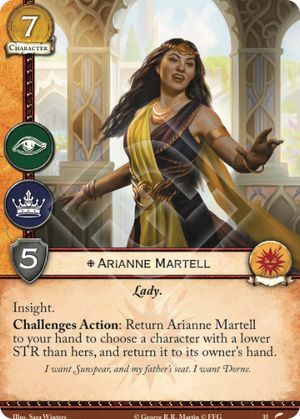 Challenges Action: Return Arianne Martell to your hand to choose a character with a lower STR than hers, and return it to its owner's hand. I want Sunspear, and my father's seat. I want Dorne. Returning Arianne to hand is a cost, and occurs even if her ability is canceled. When a card leaves play, it returns to it's owner's out-of-play area, so if an opponent takes control of your Arianne, she will return to your hand if your opponent uses her ability.